Any app to monitor RSI of all coins? Let me tell you something I’ve seen happen a few times, here in bitcoin… Over the last three years. Bitcoin goes into a period of stability. Stability lends bitcoin legitimacy, which leads to investment; then it leads to a steady increase in price, which leads to mainstream interest, then news stories, then more interest and investment. Finally, the steady growth speeds up more and more, as the renewed interest leads to a bona-fide rally. Then the local top is set and the price retraces and sets a higher low. Stick to bitcoin for a month or two, and you might see it happen again. Bitcoin is not breaking the grows yet. This is how I expect things to play out in the short term. We had a clear rejection off the top trendline of the symmetrical triangle. 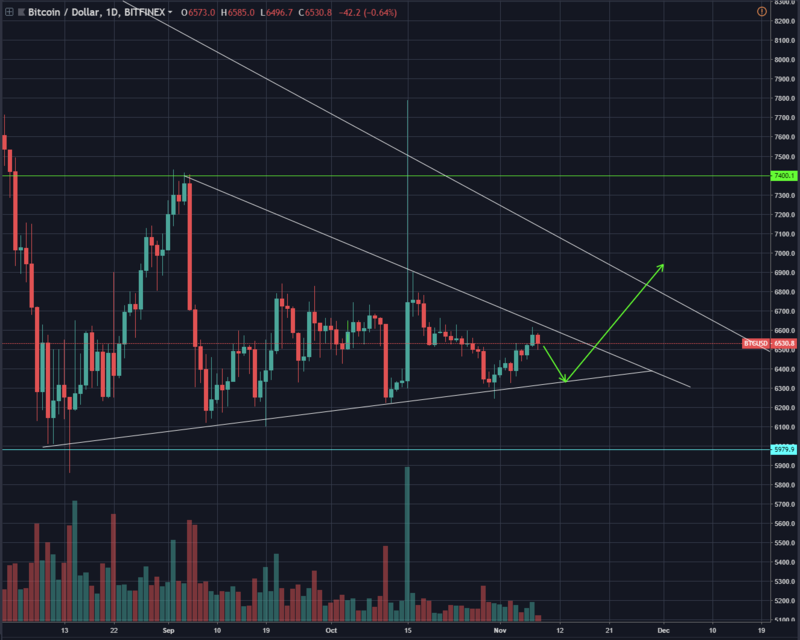 Looking for a retest of the lower trendline at approximately $6,300 in the coming days and hopefully a bounce off and a break through. A nice ascending channel pattern on the 3-day. What’s interesting is that this channel’s upper trendline crosses with my descending triangle meme line around 13th Nov and lower trendline on the 17th. Interesting to see what happens if it holds steady and breaks out above that massive resistance. If it does it with volume, there’s little overhead resistance until about 8k. Goes up $100: $20k. Drops $50 – bear town. Only thing that indicates anything rn IMO is longs r piling up. A small squeeze could get it started. Would not want to be leveraged b4 the break. Whatever way dumb money bets it’s gonna go is gonna make it go the opposite way for a squeeze. Path of least resistance. Once BTC breaks through 6800 I’ll be bullish, but for now I see no reason not to remain bearish.